Meet Cute was a book I requested entirely based on its cover. I had pure cover lust for this adorable looking book. Turns out, it’s a pretty cute, if not entirely remarkable short story collection. These were the four stories I really connected with while I was reading the book. These ones not only made me smile, but I felt they were the strongest in terms of an authentic first meeting. I wasn’t huge on the few stories that attempted science fiction, as those ones felt very awkward in the collection. I do love science fiction, but those stories felt out of place and more insta-lovey than I would have liked. Not to say the ones above don’t have insta-love, but I found my enjoyment was just there by comparison. Meet Cute has a great variety in terms of stories and I think there’s definitely something for any reader than picks it up. This entry was posted in Uncategorized and tagged arc review, book review, contemporary, hmh books for young readers, raincoast, romance, Sam, science fiction, short stories, ya, young adult on December 20, 2017 by samcmar. 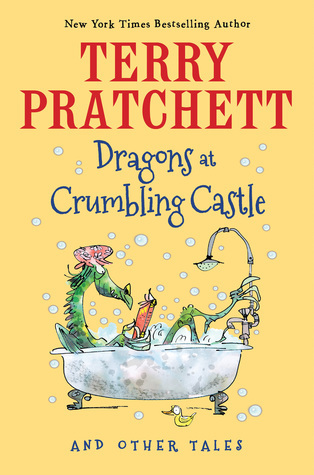 Synopsis: This never-before-published collection of fourteen funny and inventive tales by acclaimed author Sir Terry Pratchett features a memorable cast of inept wizards, sensible heroes, and unusually adventuresome tortoises. Including more than one hundred black-and-white illustrations, the appealingly designed book celebrates Pratchett’s inimitable wordplay and irreverent approach to the conventions of storytelling. These accessible and mischievous tales are an ideal introduction for young readers to this beloved author. Established fans of Pratchett’s work will savor the playful presentation of the themes and ideas that inform his best-selling novels. Huge thank you to Clarion Books and Edelweiss for this ARC! Oh my goodness, I was not expecting to read this as quickly as I did. This is what happens when you’re doing laundry and you start a page turner. Every book in this story is a lot of fun, and each is more crazy than the next. I haven’t read a lot of short fiction by Terry Prachett, but I’ve read every Discworld novel published to date, and I’ve read a lot of his middle grade offerings — the man is a comedic genius, and these stories, which come from his earlier periods of writing prove that point further. I just couldn’t stop laughing at how ridiculous a lot of the stories were in this collection. Dragons just wanting to be friends, the worst bus ride ever, to a really, really boring knight, Terry Pratchett’s characters are completely loveable as they are nuts. Some of the stories had me in complete giggle-fits, that’show much fun they were. PLUS! Their are stories of The Carpet People! I didn’t like that book at all, but I weirdly loved the short fictions about them in this collection, and it makes me wonder if I need to give that novel another chance since it was Pratchett’s first published novel. If you are a Terry Pratchett fan or you wanted something fun for a middle grade reader who appreciates comedy gold, this book is fantastic. The humor is spot-on and crazy, and this book will simply make you grin from ear-to-ear, from start to finish. This entry was posted in Uncategorized and tagged arc review, book review, clarion books, comedy, doubleday canada, edelweiss, fantasy, middle grade, Sam, short stories on November 20, 2014 by samcmar.